In the second OB Rag poll on short term vacation rentals, we asked readers what their opinion was on the current law allowing 25% of the units in an apartment complex to be short term vacation rentals. 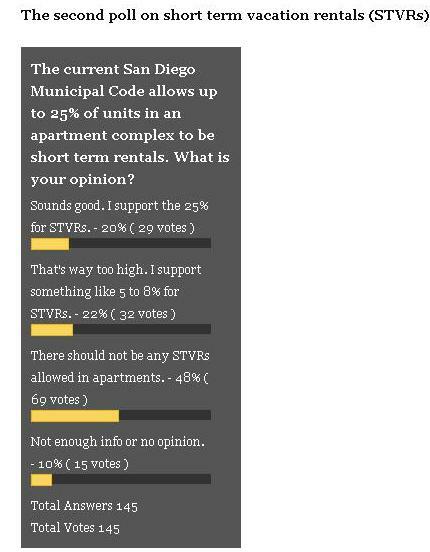 With 145 readers taking part, nearly half – 48% – agreed with the option “There should not be any STVRs allowed in apartments,” (69 votes). Another 22% said the current 25% is “way too high” and that they would rather see “something like 5 to 8” for the short term rentals (32 votes). So, that’s a total of 70% of respondents who disagree with the current municipal law. Only one in 5 – 20% – support the 25% limit, currently allowed (29 votes). 10% of those who did respond said they didn’t have enough info or had no opinion. Supposing a tighter restriction went it – take for example the proposed 5%. That would mean one unit per 20-unit complex…but there aren’t a lot of 20-unit complexes in OB. The apartment I lived in for seven years was one of only six, my mother-in-law’s complex has 12 units, many others around are treated the same. Would smaller complexes be allowed one unit, or none?